Bloodshot #0 - Regular, Gold, ...Platinum? for sale to the public or as an official dealer incentive. which was the size of a test run during the printing process. It is unlikely that there are so few in existence. revealed that some feel the print run may have been as high as 300 copies. 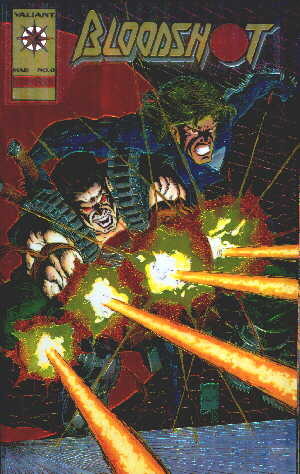 Bloodshot #0 Gold variant, where the "gold coloring"
was not applied to the cover graphics by the printer. "printer error" where a regular issue has printing discrepancies. It should be noted that this variant does not have a cover price. Multiple printer errors are known for some regular issue Valiant comics. Issues of Harbinger #1 thru #6 are known to exist with blank coupons. Ninjak #1 has been found without any white coloring on the cover. and also very dark "ivory" white coloring on the cover. 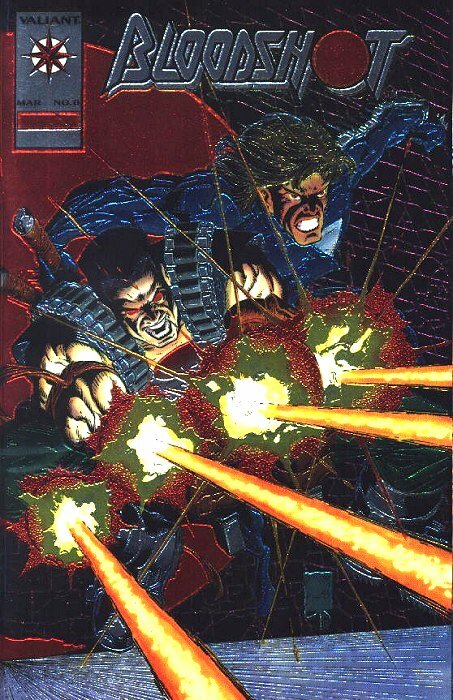 Some covers of Magnus #25 have no foil on the upper section. Issues of Deathmate Prologue exist with no foil at all. with no evidence of the necessary glue being applied during production. process was not 100% perfect. More copies means more errors, in general. up to 300 copies may have been printed at that time. 2) Jeff Gomez remembers these books as printing errors. ordering a "platinum cover" version from the printers. 4) The lack of cover price indicates this is not a "normal" printer error. It must be related to the premium gold cover because of the missing cover price. 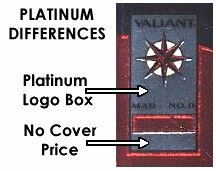 5) The cover is platinum by default when the gold ink (or any ink) is missing. The chromium material used for the cover is already platinum/silver in color. contain 11 Bloodshot #0 Gold issues, as dealer incentive books. Instead, he received 10 Gold and the one Platinum. In July 2002, a second copy appeared in an eBay.com(tm) auction. The copy changed hands for a final bid of $460 before shipping costs. The seller was a collector of the Valiant books since the early 1990's. 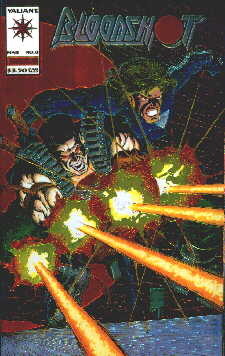 version was not documented to exist as an official variant comic. The third and fourth copies appeared on eBay.com(tm) from one owner in March 2003.
near Sparta, IL, where the books were printed in the mid-1990s. The final auction price for the third copy was $711.01 before shipping costs. The fourth copy changed hands in late-2003 in an eBay.com(tm) auction for $800. but has not changed hands publicly. of the book, in which the "no gold coloring" error was discovered and corrected. None of these ten copies have surfaced in public trading and cannot be confirmed to exist. This report of ten additional copies was later determined to be fictional. In August 2003, the first known copy of this book was graded/authenticated by CGC. and sold in an Ebay.com auction. The final bid was $2,067.42. 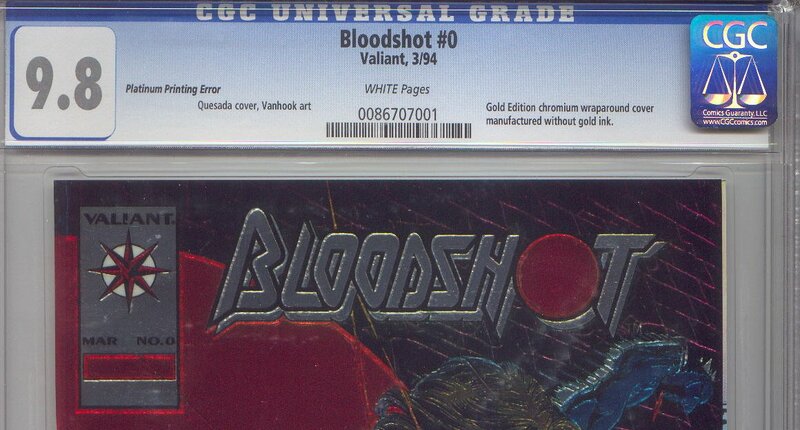 The CGC grade was 9.8, the same as the other CGC graded copy. by CGC at the 9.6 level. The total copies CGC graded stood at 4 (as of mid-2005). In September 2005, a sixth copy was listed for sale on eBay.com(tm). while working for a New Jersey comic shop owner in 1994. The auction ended early, but did not sell to the highest bidder. the book is considered "unverified". In October 2005, a CGC 9.6 graded copy was listed for sale on eBay.com(tm). selling on October 9, 2005, for $1,250. CGC 9.8 in September 2006 for $1,260. CGC 9.6 in July 2007 for $1,100. In October 2008, a CGC 9.8 graded copy was sold at a "Buy It Now" price of $5,500 on eBay.com. The CGC Census as of August 2009, reflects eleven copies that have been submitted. more formally documented by grading, public sale, or display of the books. UPDATE: As of mid-2016, CGC had graded and encapsulated 18 copies of the book. bringing the total to at least 20 known copies. If you also own a copy, please let me know.